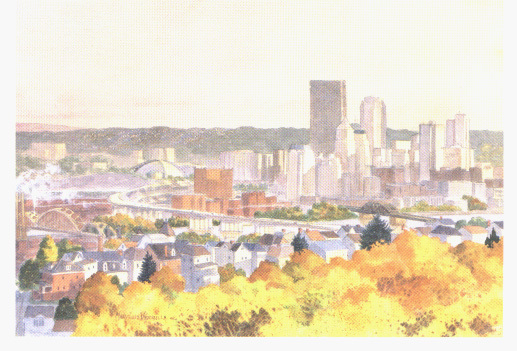 Pittsburgh, Pennsylvania, is a city with a rich historical tradition that has transformed itself over the past three decades from the world's largest center of steel production to a modern cosmopolitan city based on computing and information technology, biomedical research, and education. Located in the northeastern part of the United States, Pittsburgh is within 500 miles of more than half the U.S. population, and the city is less than 90 minutes flying time from 20 states and Canada. The #1-rated, world-class Pittsburgh International Airport provides easy access to locations throughout the world. Hospitality abounds in Pittsburgh's diverse ethnic neighborhoods, offering visitors a sampling of food, culture, festivals and celebrations inspired and influenced by the city's history and ethnic heritage. Downtown, a thriving Cultural District offers performances by the world-class Pittsburgh Symphony Orchestra, Pittsburgh Ballet Theater, Broadway Series and Pittsburgh Opera, while the city's jazz legacy is preserved and enhanced at Manchester Craftsmen's Guild and various clubs throughout the area. As one of America's safest cities, Pittsburgh's downtown restaurants, theaters and shops are easily accessed on foot or on the T, an underground rail system within the city. Pittsburgh is located at the head of the Ohio River, which is formed by the confluence of the Allegheny River and the Monongahela River. It is also situated in the Allegheny Mountains, part of the Appalachian mountain chain separating the East Coast and the Great Plains. The combination of hills and rivers results in Pittsburgh having more bridges, it has been claimed, than Venice does. The hills, rivers, and bridges combine with a notable lack of steel mills to produce a truly lovely city, with picturesque views around almost every corner. The weather in late September in Pittsburgh is usually pleasant, with daily highs in the low 70sF (23C) and lows around 50F (10C). Things to do or see before, during, or after the conference; roughly in order of distance from the conference site. The Cultural District: Numerous cultural attractions, clustered within walking distance of the conference, including the Pittsburgh Symphony, Pittsburgh Opera, several live theatre/dance venues, the Harris art/foreign film theatre, and more. Kayak rentals: for kayaking on the rivers downtown! PNC Park: our spectacular, brand-new baseball park. Home to the Pittsburgh Pirates, host of this year's All-Star Game. There are homes games versus the New York Mets on Friday evening, Saturday evening, and Sunday afternoon (see the Pirates schedule). Point State Park: The location of the original French fort (Fort Duquesne) and its successor (the British Fort Pitt), and the head of the Ohio River. A nice open space downtown. Heinz Field, new home of the Pittsburgh Steelers (professional American football) and the University of Pittsburgh Panthers (serious college American football). Carnegie Science Center: This hands-on science museum is yet another piece of The Carnegie. The Strip District: Not what you're thinking, this is a strip of land a few blocks from the conference venue. By day it's wholesale food (with some gentrification). At night, it has a busy club scene (competing with the Southside, see below). Station Square: an entertainment, eating, and shopping complex that used to be a railroad station. Gateway Clipper Fleet: A fleet of sightseeing riverboats. Just Ducky Tours: Sightseeing tour on a WW II era amphibious landing craft! The Southside: The Southside (south of the Monongahela River) was neglected from the 50s until the 80s, when it was deemed "historic". Now one of the hippest neighborhoods in the city, very busy on weekend evenings, and home to at least one speech technology company. The National Aviary: Home to over 600 birds of more than 200 species. Large walk-through exhibits allow an intimate, up-close interaction between visitors and free-flying birds. The Mattress Factory: A museum of contemporary art that presents art you can get into; room-sized environments, created by in-residence artists. Located in the historic Mexican War Streets of Pittsburgh's North Side. The Carnegie: A major cultural institution, founded by Andrew Carnegie. The main building includes an art museum, natural history museum, public library, concert halls. The local folk music society often has performances there. Kennywood: local amusement park, National Historic Landmark, with several of the best wooden rollercoasters in the US. Sri Venkateswara Temple: For Hindu visitors, Pittsburgh has a number of remarkable Hindu temples. This is the one visible from the freeway east of the city (I-376). Fallingwater and Kentuck Knob: a famous house designed by Frank Lloyd Wright, and another nearby Wright house, both open for visitors. Ohiopyle: perhaps the most interesting of the many local nature areas. Includes serious white-water rafting, nature preserve, swimming, and the 18-foot high Great Falls of the Youghiogheny. A bicycle path going from Pittsburgh to Washington, DC, is mostly finished, and goes through the park. The "fort" has been recreated on the original site; located just off of US Route 40. Moraine State Park: Glacial moraines and Lake Arthur, a man-made lake that reinstantiates a glacial-era lake. (This was the southernmost reach of the last Ice Age glaciers.) Nearby McConnell's Mill State Park is also lovely. West Virginia, including some true wilderness. Cook Forest: canoeing and hiking; its "Forest Cathedral" is one of the last stands of old-growth (read: gigantic) trees in Pennsylvania. Theoretically you can actually hike there from Pittsburgh on the Baker Trail. Erie: "Presque Isle" State Park/Lake Erie/Perry Monument and flagship. In the War of 1812, there were naval battles in Lake Erie between Britain and the U.S.! Cleveland: Rock and Roll Hall of Fame, the Flats, Sea World. The Greater Pittsburgh Convention and Visitors Bureau has a lot of local information. The University of Pittsburgh has a web page listing local activities. Carnegie Mellon also has a Visitors web page and a grad student web page listing local activities. There is also an official Pittsburgh city government website.